Bringing clarity and focus to how your team contributes to the success of your practice can enhance overall results and attainment of your business goals. Not enough employees in general, and especially in our industry, understand exactly what it is they are responsible for producing. They know their job title, schedule, and may understand some components of what you expect them to deliver. They know they are responsible for taking care of patients or administrative tasks, but they lack the specificity to be able to tell you what the two most important things are in performing their job. For example, the primary responsibilities of a front desk worker might be to (1) schedule patients and (2) collect copays. But if you go to your front desk right now and ask them what their job is, you are likely to get a long list of activities, none of which are necessary for scheduling patients and collecting copays. This lack of clarity inhibits their ability to prioritize and know what is going to be most important to the success of the business, the team. Bringing razor-sharp focus to every single team member’s deliverables can begin to shift your culture from one of activity to one of results. If a results- or outcomes-focused culture is important to you, then using objective and measurable goals is a great way to move in that direction. Assigning responsibility for components of these goals is another giant step toward a culture of accountability. We tend to pay people based on past performance or based on their level of effort, but that is not how you are compensated. As a business owner, you get paid based on results or production. What those specific results are may vary by business or setting, but ultimately patients, clients, employers, and payers are increasingly looking to measurable results to determine the value you are delivering. If your time, energy, and effort produce results, then they are productive uses of your time and energy. But you have seen people expend a great deal of effort without achieving any results. This is not a desirable state for the members of your team. 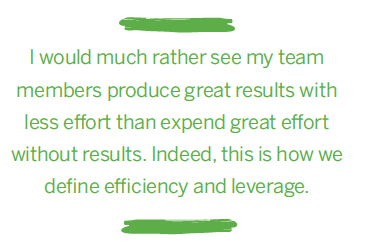 I would much rather see my team members produce great results with less effort than expend great effort without results. Indeed, this is how we define efficiency and leverage. Seldom do I see companies that have clear accountabilities assigned to all of their team members. Sometimes a few people, like in sales, know what they are responsible for producing. But others in other areas are not clear about how their performance is being measured, if at all. And if a team member does not know how they contribute to the overall success of the company, then how are they able to prioritize their time and efforts in order to achieve the best overall result? Creating clear accountabilities and measurable results for each employee that feed into the bigger picture goals and key performance indicators (KPIs), and thus the overall success of the organization, will allow you, and them, to know exactly how they are performing. You can then tie compensation to results, assign additional responsibilities to those likely to deliver, and minimize conversations around “how hard I worked and therefore deserve a raise.” You will have something objective and definable to point to and direct your team members’ efforts toward activities that will contribute to the greater success of the team. If you’re a sports fan, you see this frequently. Sport is riddled with statistics. They are used in real-time during games, as well as being the determinants of who gets into the Hall of Fame. My son collects baseball cards. Baseball probably holds the apex in sports as a game of statistics. Presumably the statistics listed on the back of each baseball card tell you not only how good the individual player was, but also how they contributed to the overall success of the team. And there are different statistics for different positions on a team. Different people are responsible for different outcomes that contribute to the overall success of the team. And when those statistics don’t contribute to the team’s success, we may be measuring the wrong statistics. This is no different running your company. The only significant difference is we don’t get a score at the end of each game. We may not get an immediate score, head to head, with our competition. But we can keep score on a daily, weekly, monthly, or quarterly basis. When we monitor our statistics, also known as KPIs, we know how we are performing. Benchmarking against other companies allows us to know if we are meeting averages, or exceeding or falling below industry standards. Making members of our teams responsible for delivering and driving each statistic is a form of delegation that can leverage other people’s time and energy in order to allow us to work on our businesses. This can make our lives easier while achieving superior results. And it can help create clarity for each team member and thus improve engagement and retention for the team members who really want to contribute. 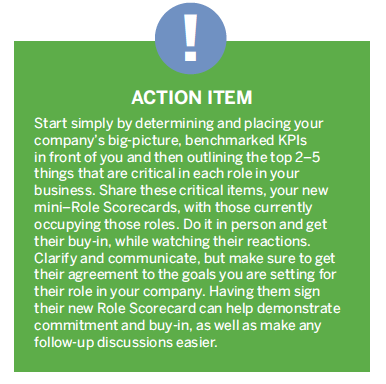 A Role Scorecard, basically an abbreviated job description, can help you begin this process of assigning the right number and the right activities to the right people. A very simplified example of one is included below. You can modify this and expand it to encompass all the things that are important to you for each position. Being more comprehensive is desirable, leaving less to chance and interpretation. At my company, we use Role Scorecards in our recruiting and hiring process, as well as induction, reviews, and to determine performance standards and thus compensation. 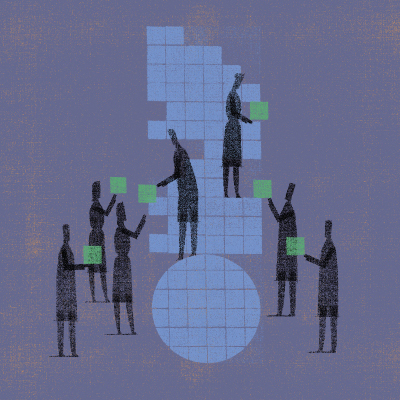 It removes a great deal of subjectivity from management and allows team members to know exactly where they stand and what expectations are for each role. Sturdy McKee, PT, MPT, CEO, is a business coach and adviser at www.SturdyMcKee.com and the chief executive officer and cofounder at San Francisco Sport and Spine Physical Therapy, ScheduleDoc.co, and Major League Orthopaedics. Sturdy is a member of PPS and serves on Impact magazine’s editorial board. He can be reached at sturdymckee@gmail.com.